Ruth Phillips is an English cellist living Provence, France. She is married to Julian Merrow-Smith, an artist I have written about previously. After Duane Keiser, Merrow-Smith is one of the earliest pioneers of the “painting a day” painter/blogger model of creating small daily paintings and offering them for sale over the internet. He also happens to be one of my favorite contemporary painters. 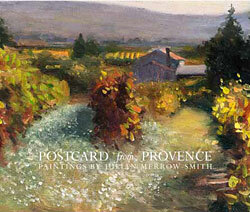 I’ve been following his daily paintings blog, Postcard from Provence, since 2006. In one of my previous posts about Merrow-Smith, I pointed out that watching the images of his postcard paintings arrive by email day after day, as well as traveling back through time by looking through his extensive archive of previous work (over 1,600 at this point), was particularly appealing because I saw within the series of paintings a story, as the landscapes and the fruits and vegetables gathered from local markets for still life paintings changed with the seasons, and as Merrow-Smith worked, experimented and grew as a painter over time. Here, then, is another side of that story, along with Phillips’ own, as she works to balance her life as a cellist, a wife, an artist’s assistant, an Englishwoman in Provence, a homeowner and an observer of the life, and lives, around her. In her book Cherries from Chauvet’s Orchard: A Memoir of Provence, Phillips has given us a verbal parallel to her husband’s postcard sized paintings — small colorful glimpses of other places and other lives. In succinct, three or four page chapters, she paints vivid short scenes of life in Provence, lives of the villages in which she and her husband have lived, lives of the individuals they have encountered and lives of some of the people who have purchased Merrow-Smith’s paintings. The latter glimpses are often told in the individuals’ own words, included in italics as chapter beginning or chapter ending quotes. They were gathered in response to a request Phillips sent out for the purchasers to write with short accounts of their particular Merrow-Smith painting or paintings, where they were hung and what they meant in their lives. She received a much more extensive response than expected, from which she culled down selected accounts to season the book. Each chapter of Cherries is titled as one of Merrow-Smith’s paintings, sometimes directly related to the subject of the chapter, sometimes just in a metaphorical relationship. The quotes, likewise, are sometimes directly and sometimes obliquely related to the subject of the chapter. Within these short postcard-like glimpses, Phillips manages to tell the story of her relationship with Merrow-Smith, the beginnings of their marriage and their efforts to make an uninhabitable shell of a house in Southern France into a living home and studio against the tide of an arcane rural French bureaucracy, as well as the story of how “the painter who never painted” became an early practitioner of the “painting a day” discipline, and eventually one of the most successful of the painter/bloggers — artists who pioneered the use of the internet to bypass traditional gallery markets and take their work directly to their patrons around the world, even from a small village in rural France with spotty dial-up internet access. The book, save for its cover, is not illustrated, but the perfect companion volume exists in the form of Merrow-Smith’s beautiful collection Postcard from Provence: Paintings by Julian Merrow-Smith (my review here). Of course, if you already have Postcard from Provence, Cherries from Chauvet’s Orchard makes the perfect companion to that book. I found it particularly enjoyable to have my copy of Postcard from Provence handy as I read Cherries, and leisurely turn between them, each providing “color” for the other. 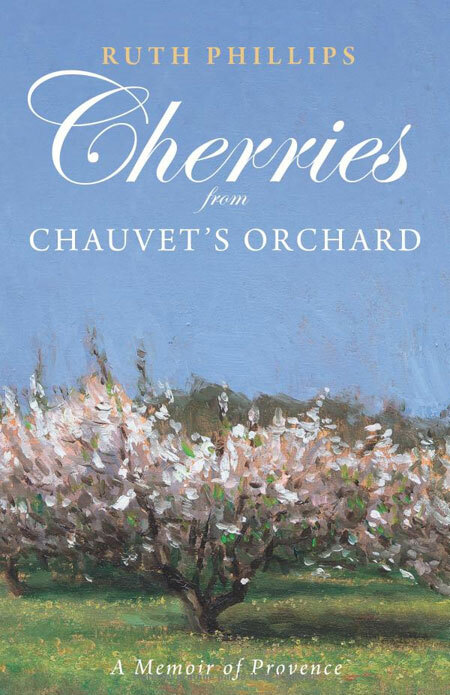 Cherries from Chauvet’s Orchard can be ordered directly from Merrow-Smith’s website, as can the Postcard from Provence volume. Both are also available from Amazon, Barnes & Noble and other booksellers in the US and UK (links are provided on the site). You can read a sample of Cherries on fReado. In addition to her website, Phillips writes two blogs, cello notes and meanwhile (here in France). In the latter, she chronicles her life in Southern France, in some ways providing a continuation and extension of Cherries from Chauvet’s Orchard. The episodes in the book’s short chapters, some sweet, some sour, are like the eponymous cherries picked from their Provençal neighbor’s orchard. They can be read as a memoir, a love story, a series of character sketches, an account of an artist’s progress or the chronicle of the early stages of a shift in the paradigm of how art is created and sold in the 21st Century. Take your pick. I have read this book and found it very interesting. It is an honest portrayal of what it is like to be an artist and how difficult it can be to keep producing work. It also highlights what it can be like to be a family member of an artist. I’m sure they sometimes just want to say “go to your studio and do something”.